It has been said that a wedding day is the most important day of a womans life. If that is true, this Groundbreaking Zombie Bride is not going to let a little thing like death come between her and wedded life - or unlife, now! All she needs now is her zombie groom, and she will be ready to commence the happiest day of her undead existence. Although this zombie bride was probably prettier in life, she still manages to possess a modicum of elegance in death. This zombie bride wears the tattered and ragged remains of her wedding dress, as well as a white headpiece with red decorations over the scraggly, deathly silver hair. Her skin is almost as pale as her dress and is sunken and withdrawn, pulled tight across her bones, making it appear as though she has no skin at all. Her hands are equally pale, although her vivid red nails help to contrast her deathly pallor. This life-sized latex prop has pose-able arms and is definitely a great way to make a statement with your own Halloween decorations. 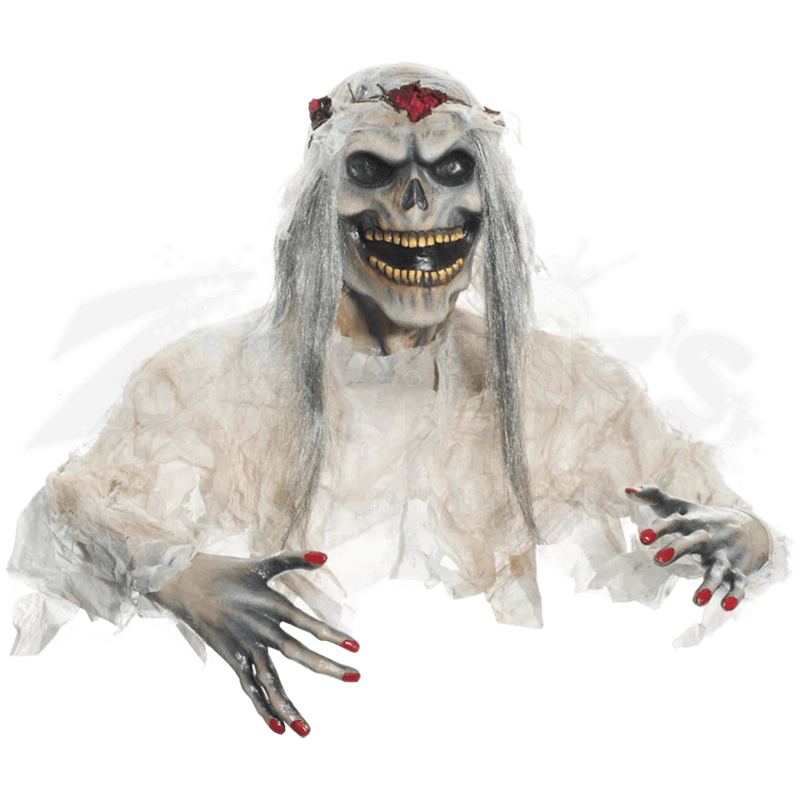 Pick up a groom for the Groundbreaking Zombie Bride and give her the wedding that every ghoul dreams of, or situate her off on her own and let passersby form their own stories about why this bride has turned into a flesh-eating ghoul.